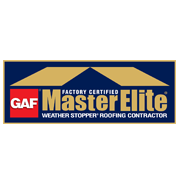 Is your Roof in Good Hands? 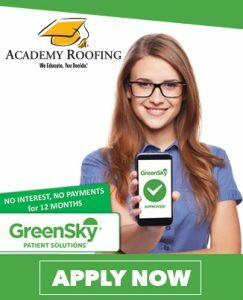 | Academy Roofing | Commercial and Residential roofing contractor and repair company in Atlanta. You are here: Home / Blog / Hail / Is your Roof in Good Hands? Here are two pictures of the homeowner’s hail and wind damaged roof. Nope. The adjuster said that it was blistering. Blisters. Now, many homeowners might know what blisters are as a result of the Atlas Chalet shingle or the Owens Corning Supreme shingle getting airtime on the news. 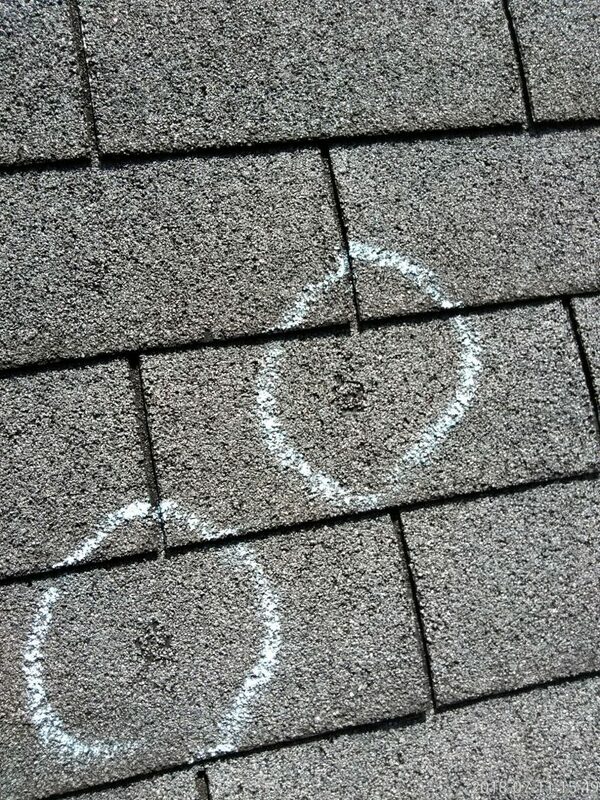 However, this adjuster clearly was inexperienced and didn’t know the difference between blisters and hail damage. Here is what blisters look like on a shingle. They create bumps and little pot marks on the shingle. We can understand that Allstate has a lot of turnover in the adjusting department but this is getting ridiculous. Adjusters need to know the difference between hail and blisters. Fortunately for this elderly woman, the case has not been closed and we immediately called for a reinspection. As a policyholder, many times you can have up to three inspections and request a different adjuster each time. Time will tell if Allstate does the right thing on this claim. The second story begins when a severe wind came blowing across Atlanta knocking down trees, branches, and caused some power outages. We received a call from a homeowner who happened to be friends with one of our repair technicians stating that a tree had fallen and hit his home. 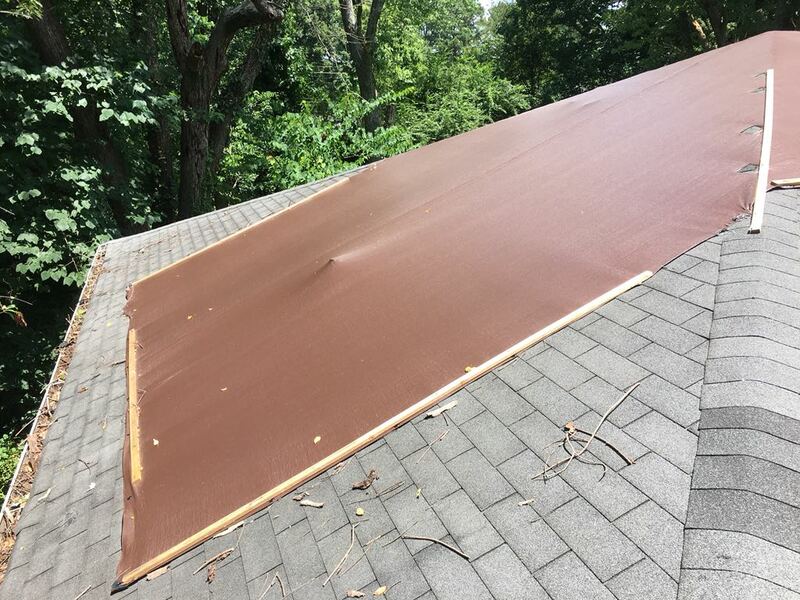 Academy Roofing immediately went out and put a tarp over the damaged area to prevent additional water from entering the home. Unfortunately, the damage from the tree caused damage to the roof on multiple sides so the homeowner called their insurance company, Allstate, to report a claim. The day of the adjuster meeting comes and the adjuster gets up on the roof, documents some of the damage from the tree, and mentions how the roof failed a brittle test as well as had wind damage to the shingles. 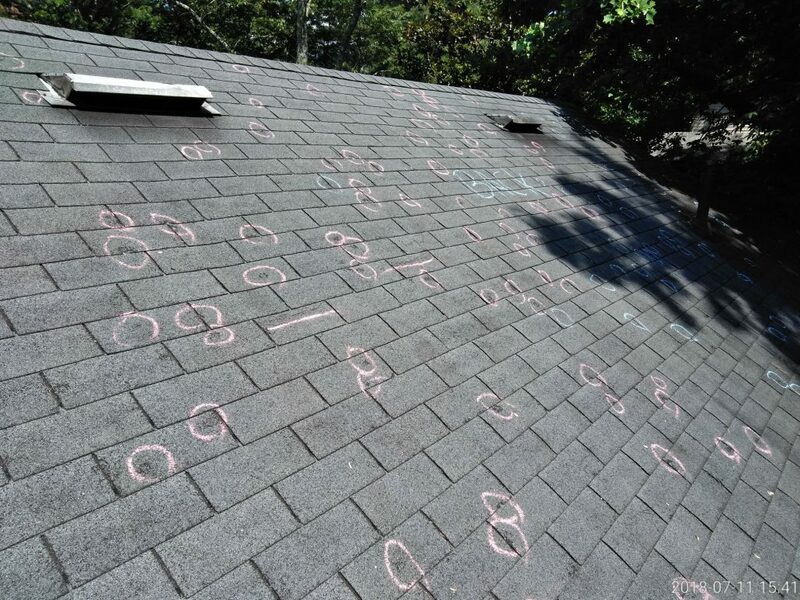 According to Underwriters Laboratories, a brittle test or wind resistance test is conducted by lifting a tab 90 degrees and if during the test the shingle shows no permanent damage then it passes. 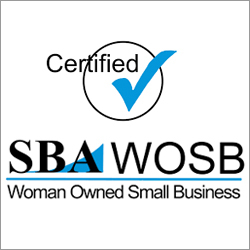 However, if during the test, the shingle creases, tears, cracks, or splits, the shingle has failed the test. The adjuster stated they approved everything and would be sending the homeowner the paperwork and first check. 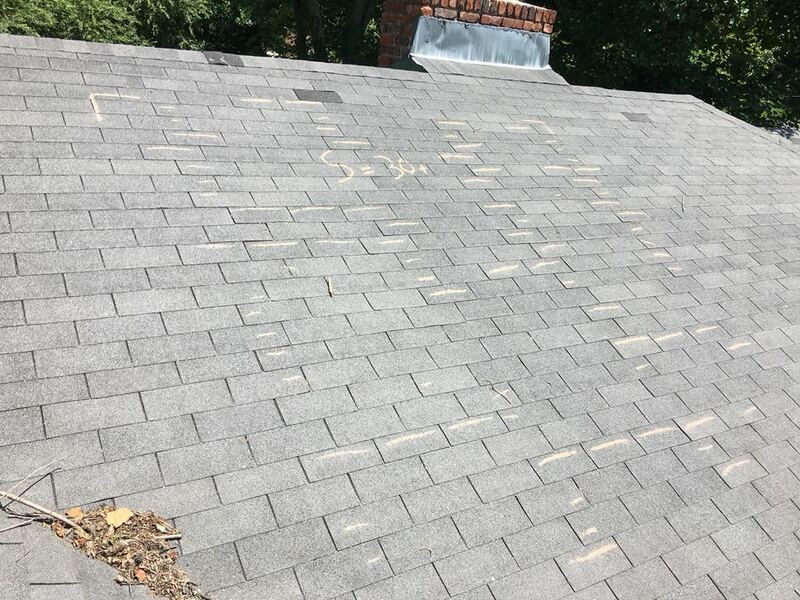 The homeowner received the paperwork and first check but upon forwarding Academy Roofing a copy, we noticed that the entire rear slope of the roof was missing off the estimate. This was not only the section affected by the tree damage but had the worst wind damage of all slopes as well as failing the brittle test. Immediately, we called Allstate and were told that they did not have pictures of the rear slope and needed pictures if they were going to pay for the rear slope. Academy sent out a representative to take pictures and then emailed them to the adjuster. 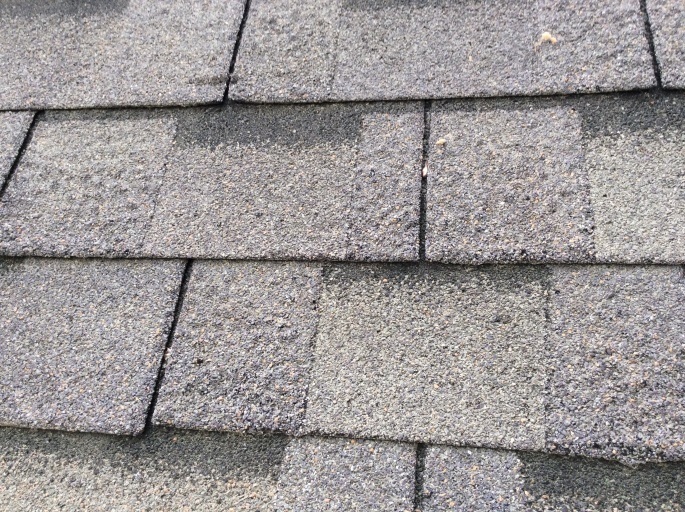 Here is one of the pictures showing wind damage to the shingles. The seals are broken and debris is under the shingles from the wind damage. 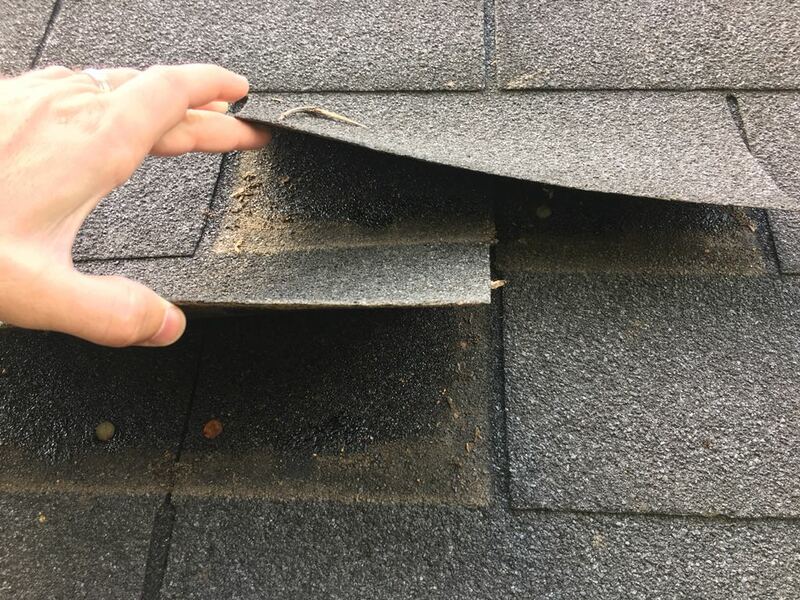 The next day the adjuster confirmed they received the pictures but stated they needed a test square which is a 10×10 square foot area of each slope to see how many shingles are damaged by wind in order to warrant paying for a full roof. Again, Academy sent another representative by to do exactly what they asked. Here is a picture showing over 30 wind damaged tabs in a 10×10 area. Each one failed the brittle test as well. 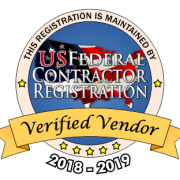 Please note that what Allstate is asking for is something the adjuster should have done when they first initially inspected the roof but we wanted to get this resolved for the homeowner as they are anxious to get the repairs going. The adjuster, despite having all the requested documentation, is still refusing to pay for the rear slope of the roof. The homeowner is now fighting with Allstate to pay for the full roof so they don’t end up with a checkboard roof. Many homeowner’s associations will not allow mismatched shingles on the roof which gives it a checkboard appearance. To be honest, these two stories are way too common when it comes to Allstate or one of their subsidiaries like Encompass or Esurance. 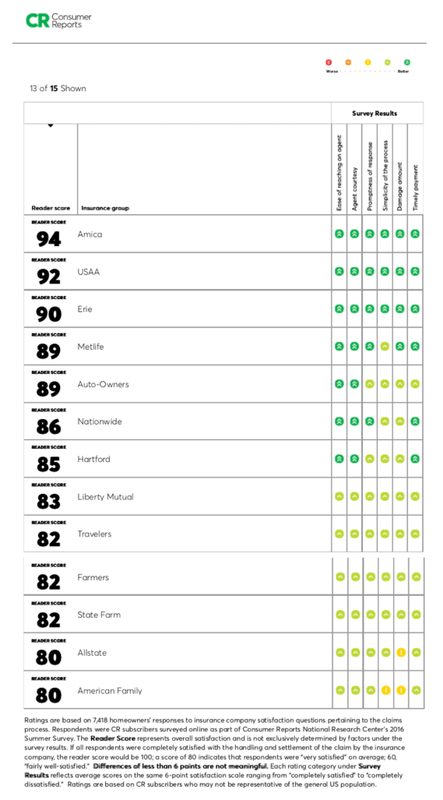 Consumer Reports ranked homeowners insurance carriers and as you can see, Allstate was second to last. They might be good for auto and life but we could not recommend them for homeowner insurance based on how they treat roof claims.